Cantor's Canvas Pray. Sing. Knit. A famous Buddhist parable tells of a group of blind men who heard that a strange animal, called an elephant, had been brought to the town. Since none knew what an elephant was like, they endeavored to describe it based on their sense of touch. The first man, standing near the trunk of the elephant declared, “an elephant is like a thick snake.” The second, standing near the ear declared the first wrong, “an elephant is like a fan.” The third, standing by a leg said that the elephant is like “a tree-trunk.” The fourth, standing by the side of the animal said that an elephant is “like a wall.” The fifth standing near the tail said an elephant is “like a rope.” The last man, near the tusk said, “an elephant is hard and smooth like a spear.” Focusing in only on that part of the animal that they could immediately experience limited their understanding of the whole. In this week’s Torah portion, B’ha’a lot’cha, the Israelite people in the wilderness complain bitterly. They weep and cry saying, “If only we had meat to eat!! We remember the fish that we used to eat free in Egypt, the cucumbers, the melons, the leeks, the onions, and the garlic. Now our gullets are shriveled. There is nothing at all! Nothing but this manna to look to.” (Num 11:4-6) The manna that they refer to, the Torah tells us, came free with the dew, could be made into cakes, and tasted “like rich cream.” (Num 11:8) Because they are so focused on one single aspect of their past, they ignore the fact that the food they got in Egypt came along with slavery, torture, and subjugation. They forget that the manna they eat in the wilderness comes abundant, free, and tastes good. Like the blind men in the story, their attention on only the one thing right in front of them prevents them from experiencing the entire wondrous animal. Now perhaps manna got tiresome after a while, but widening their scope would have allowed them to witness the miracle and appreciate its essence. We Jewish people love to kvetch. Sometimes I think it’s almost like a social lubricant. We can all relate to misfortune so easily. We can laugh together at the little things that go wrong, the shared indignities of life. Talking about our joys can seem a little like bragging, but sharing our troubles does not. It can go too far, however. 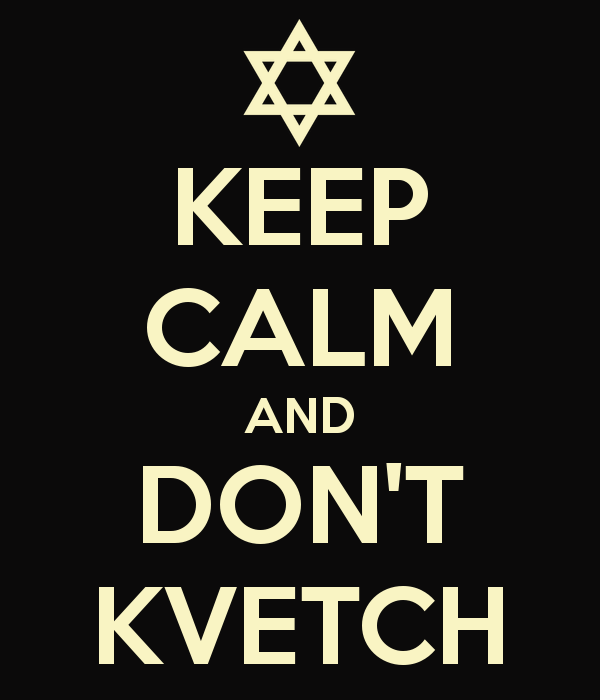 Kvetch too much and you are a whiner, someone unpleasant to be around. The literal meaning of the word, kvetch, is to squeeze or press. This Shabbat, let us take a moment to press a little less, to broaden our vision to encompass the many blessings abundant in our lives despite our valid reasons to complain. In short, let’s not let our kvetches turn us into wretches but rather focus on our b’raches (blessings) and share our naches (sources of pride).